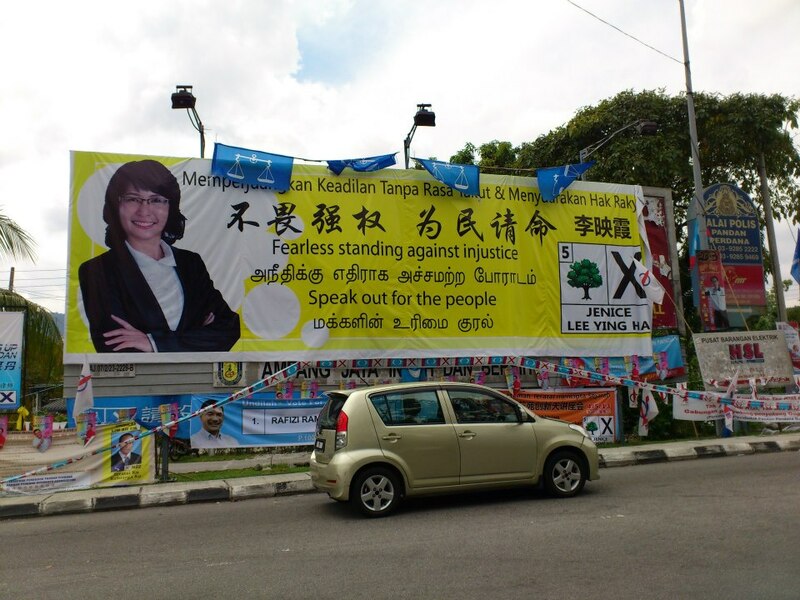 Almost two weeks after the polling day, the elections are still a heated topic in Malaysia. Ten of thousands of Malaysians are attending rallies held by the opposition protesting the election results. Well, the ruling party won, even though the electoral process was fraudulent with many alleged irregularities. The polling started at 8am in Malaysia (2am in France). I couldn't sleep so I woke up around 1.30am to follow updates on Facebook. Friends posted photos showing long queues in varies polling centers. 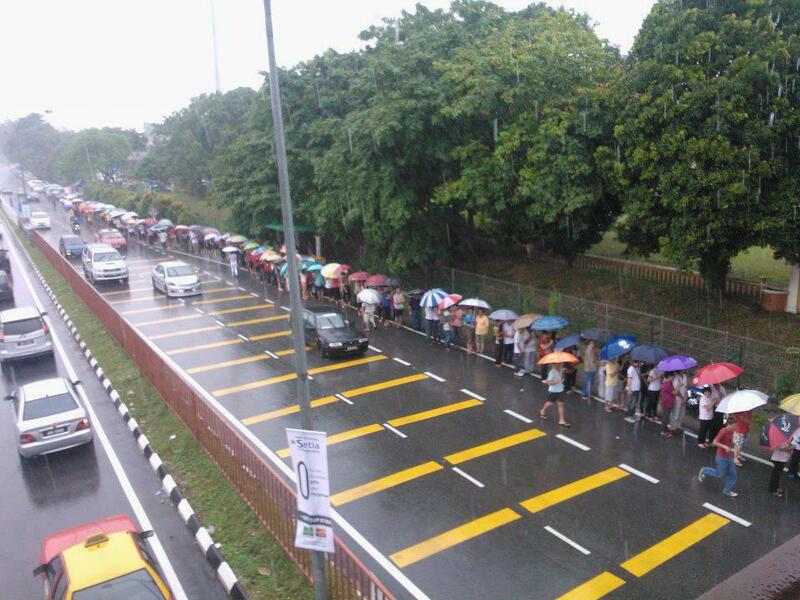 My fellow Malaysians were queuing in the rain waiting to cast their votes. An historically 80% turned out responding to calls from varies parties / groups to vote for a change. Past 8am, photos with blue finger started to flood into my Facebook page. 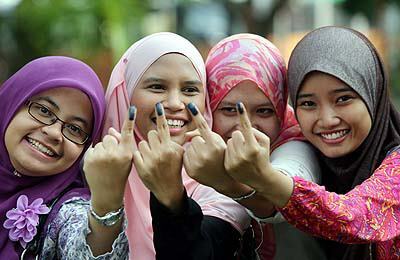 Photo above shows proud Malaysians showing off their blue finger indicate that they have voted. 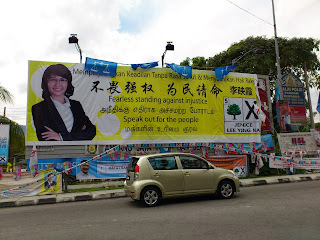 Photo above shows a candidate advocating in 4 different languages, to appeal to the diverse demographics in Malaysia. What struck me the most were photos and videos showing angry people blocking the suspected phantom voters from voting, especially those with foreign faces. Rumors circulated that the government handed out ID to foreigner workers and sent them to varies polling centers to vote for them. The opposition parties were calling the people to "catch the ghosts" resulting in electorates monitoring around. Thats appalling if it is true. Around 7am the result showed that the ruling party has retained the majority and would continue its mandate after 56 years in office. This ended the hope for many who wished to see an implementation of a two-party system. It was a nervous yet exciting day, I have never so "political awaken" before. I was not disappointed at the results, but a deep saddest hovering around due to the credibility of the whole election process. Suddenly, I felt a great envy towards hubby, as it seems that his country carries an electoral system in which people can trust. Anyway, we should not lost hope. French women were granted the right to vote in 1946, only eleven years before the Malaysians. So, let's continue fighting for a clean and creditable electoral system. Malaysia Boleh!